We found lots of options for great turns on Mt. Washington’s snowfield’s this weekend. 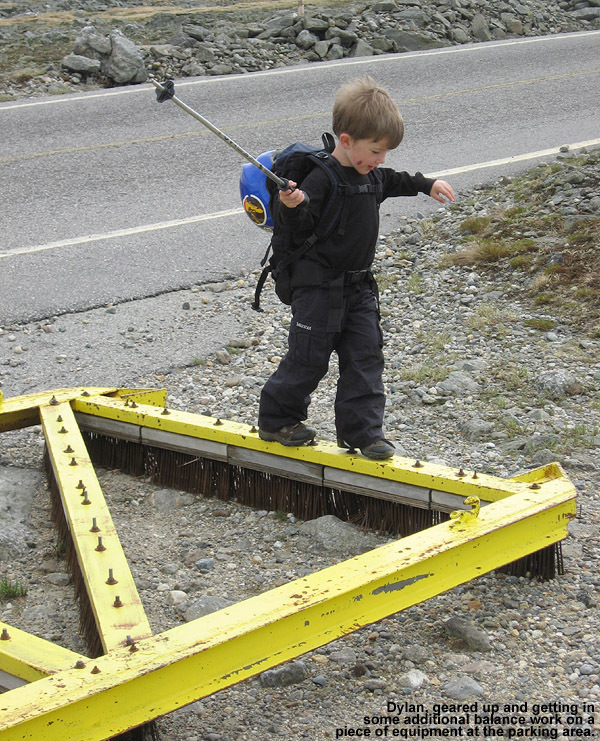 The Mount Washington Auto Road was finally open for business by the weekend of May 22nd – 23rd, but since E was out of town, Memorial Day weekend was our first opportunity for a ski trip. 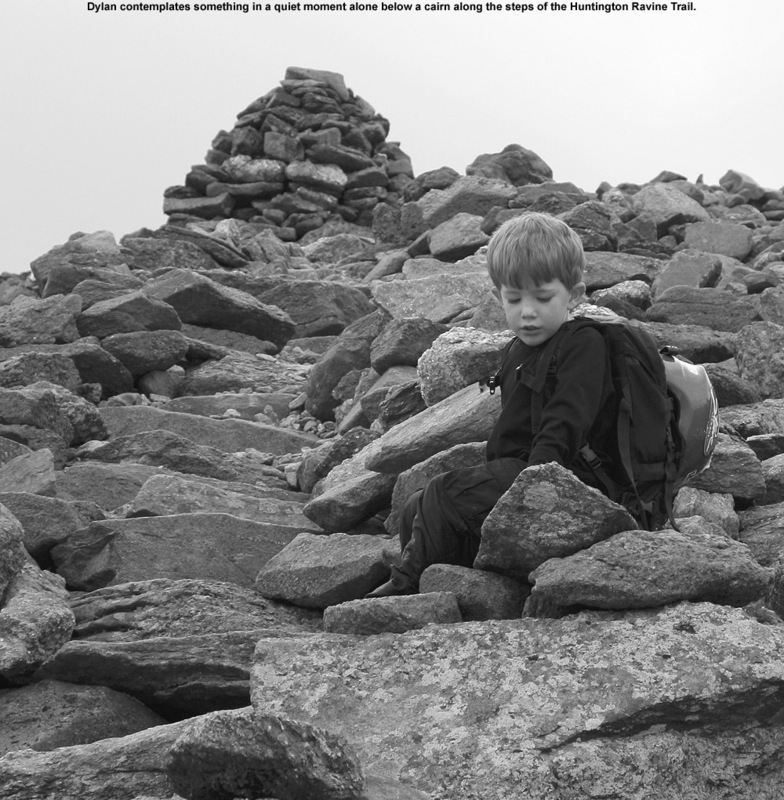 As always, weather was an important determinant in whether or not we would try to take the boys up the mountain, but as the weekend grew closer, the good forecasts continued to hold. None of the days looked like a total washout, but Saturday looked like the best bet since the NWS point forecast indicated the chance for gusts as high as 100 MPH in the higher elevations of the Presidential Range on Sunday, and Monday had higher potential for precipitation. On Friday evening we put ice packs in the freezer, charged batteries, and planned to make a final check on the forecast in the morning. Saturday morning’s forecast still looked decent; there was a chance of precipitation in the afternoon, but winds were expected to be low with comfortable temperatures. I reserved a campsite for Saturday night, and we spent most of the morning getting things together for the trip and taking care of other stuff around the house. We finally headed out in the late morning under mostly cloudy skies, but no signs of precipitation. 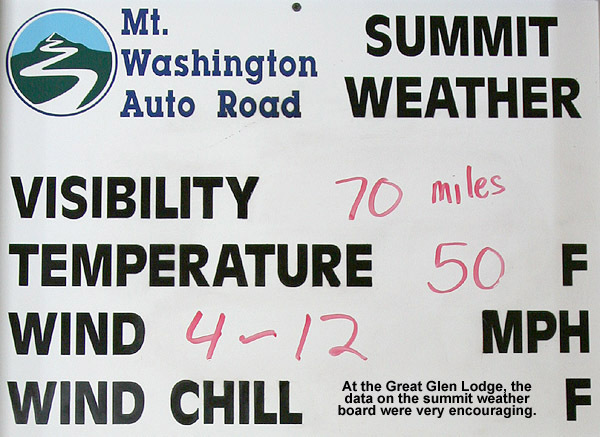 Once we’d reached the base of the Mount Washington Auto Road, we stopped in at the Great Glen Lodge to hit the restrooms and check on the summit weather. We were excited to see that the summit weather board indicated winds of just 4 to 12 MPH and a temperature of 50 F. Even better though, was being able to look up toward the higher elevations to the west to see blue skies. Last year’s trip featured 50 MPH winds and fog, conditions that were more amenable to playing in the strong gusts on the deck of the observatory than skiing with the boys. From our views along Routes 2 and 16, the snow up high looked less plentiful than we’ve often seen at this time of year. 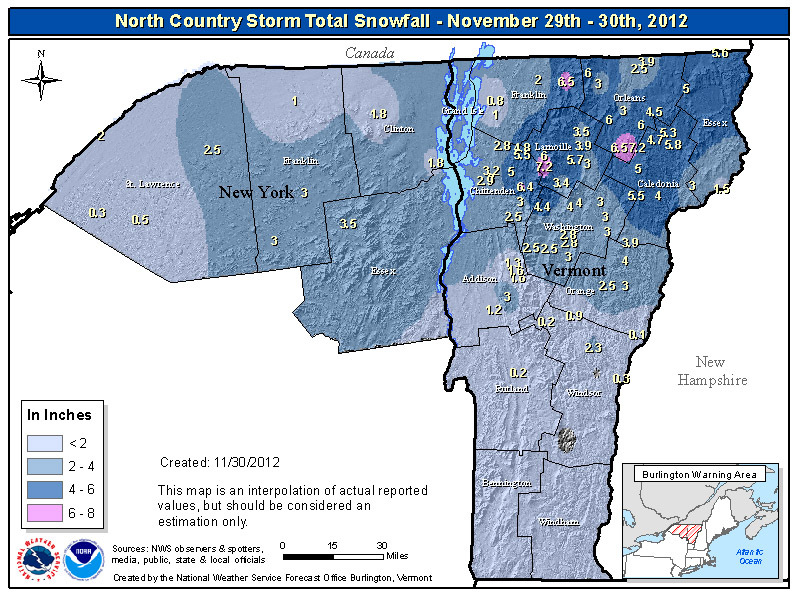 The level of the snowpack was potentially due to at least a couple of factors. Although there were some nice snowy storms in April and May, too many of the midwinter storms skirted off to the south of Northern New England this season, and more recently we’d seen warm, or even hot, dry weather with lots of sun. One never really knows quite what the snow situation is going to be until they get up on the mountain though, and based on the Mt. 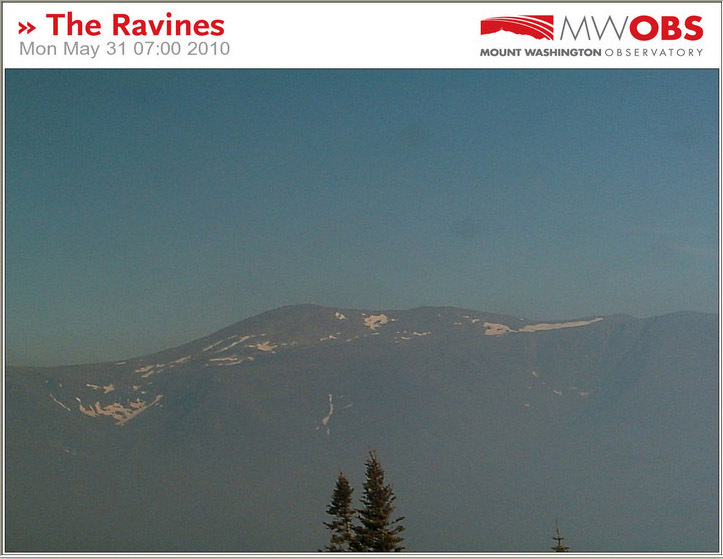 Washington web cam images, we knew there was going to be plenty of terrain to ski. The fair weather made for an enjoyable drive up the Auto Road, and the views were stupendous as usual. We stopped in just briefly at the summit, and got an overview of the various eastern snowfields on the drive back down the road. We could see that there were plenty of options, and continued our drive down to the parking area below Ball Crag where we’d based ourselves before. 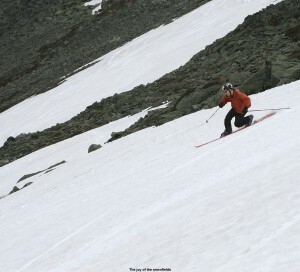 Consistent with the faster depletion of the snow this season, although potentially due to seasonal variability as well, the snowfield that we’d skied with the boys in May of 2008 was absent. 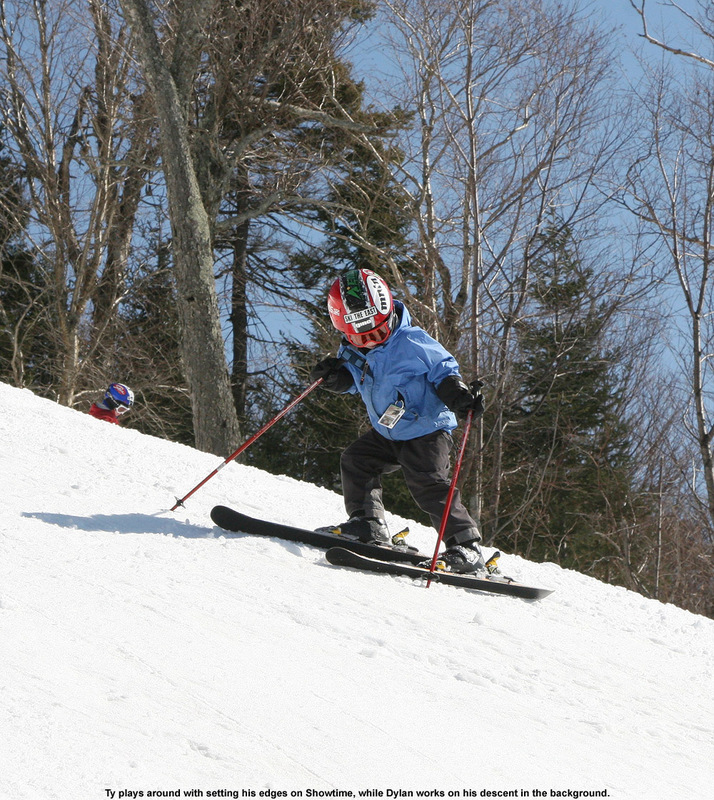 But, based on the boy’s enthusiasm, along with their improved endurance and ski abilities, we were looking to hit some different snowfields this season anyway. The plan was to head up the Nelson Crag Trail for a bit as we’d done on our last ski trip to the area, and then traverse generally southward below Ball Crag to search out some snowfields that would work well for everyone. Our equipment setup from our last Mount Washington ski trip had worked well, so we used a similar configuration with just a couple of changes. 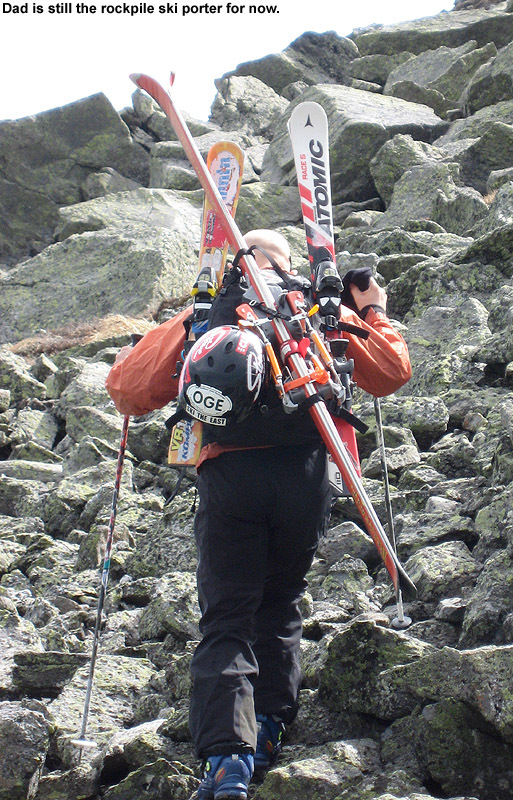 I carried the big SLR in my photo/ski pack, which is also set up well to carry multiple pairs of skis, so I carried mine as well as the boy’s. 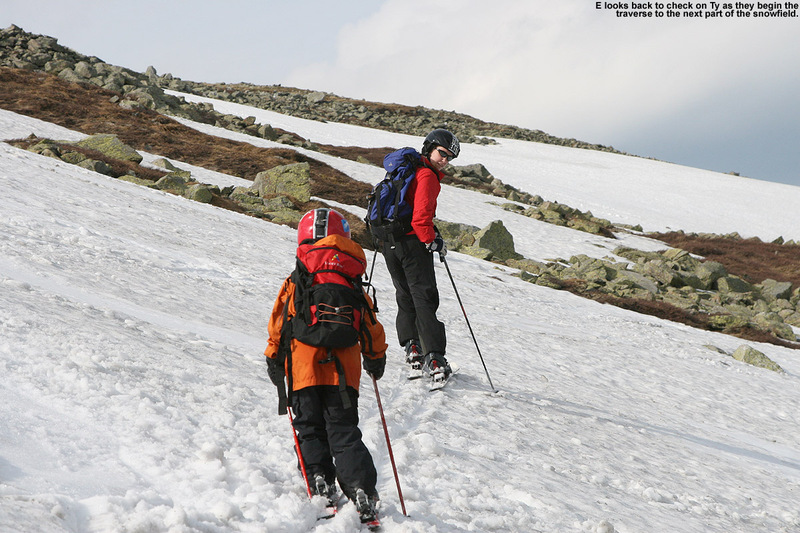 E and I simply hiked in our Telemark boots, but since the boys would be skiing in alpine ski boots, they wore their hiking boots to make their traveling much easier, and along with her skis, E carried their ski boots in her pack. 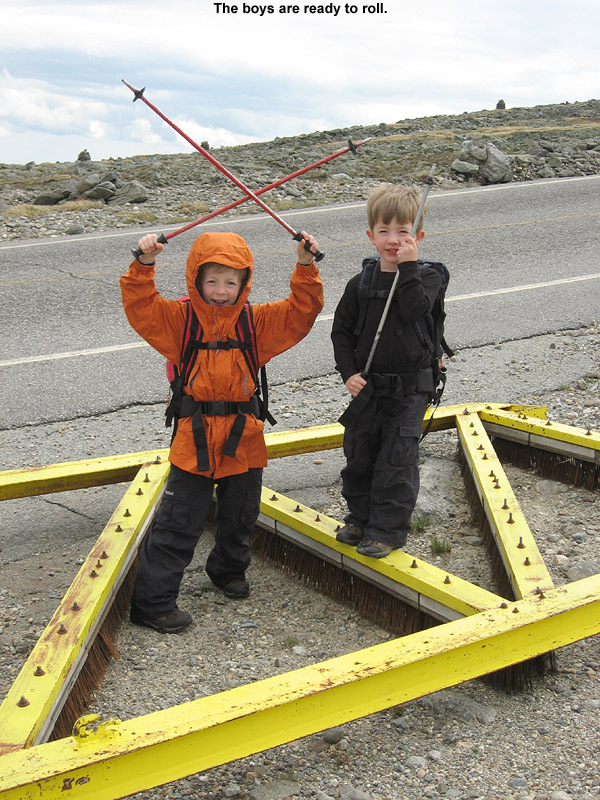 The boys had their poles for hiking, and a new addition this time was that they carried their water, food, clothing, and helmets in/on their packs. We hiked roughly two tenths of a mile up the Nelson Crag trail before breaking off and contouring southward. 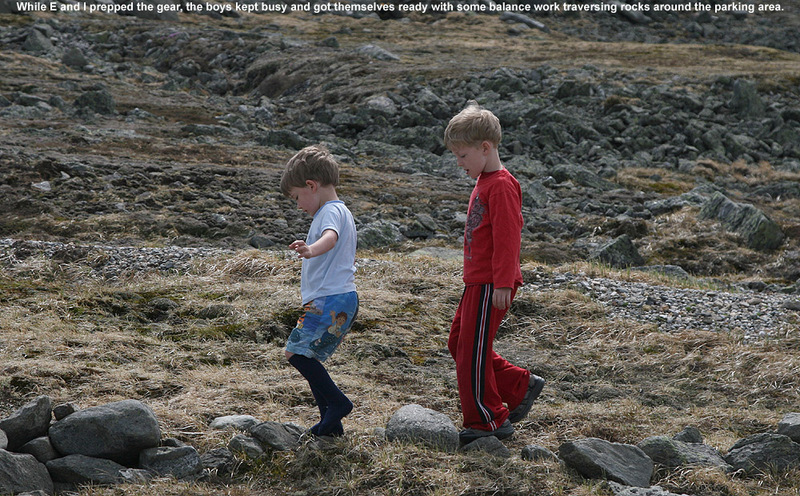 The boys were very mobile in their hiking boots and light packs, and they moved along at a great pace. 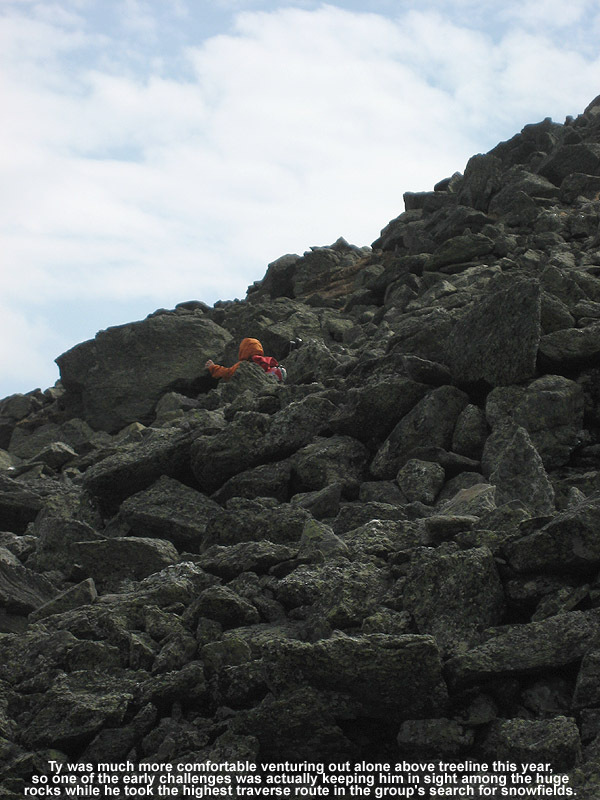 Compared to our last ski outing on Mount Washington, Ty was much more comfortable traveling through the alpine setting; he was well ahead of the rest of the group and opted for a much higher traverse. 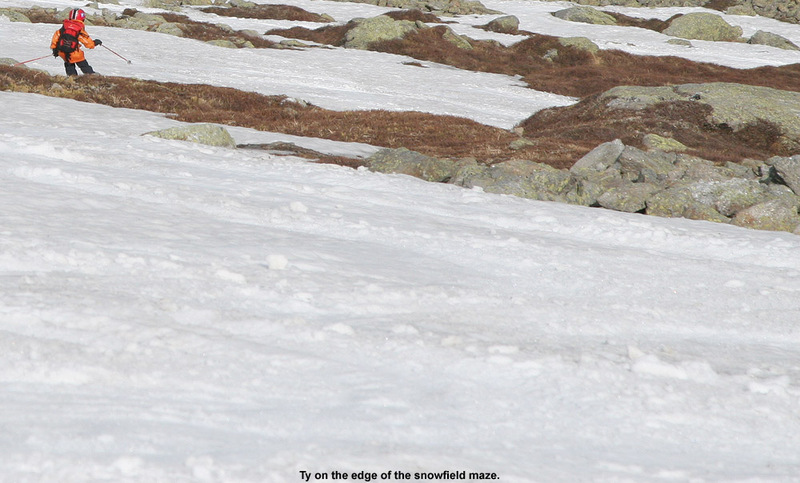 I knew that we would eventually run into the main portion of the east snowfield if we didn’t run into any other snowfields first, but there turned out to be earlier options. Ty was the first to spot some of the bigger snowfields below us along the Upper portion of the Huntington Ravine Trail, and we planned to work our way toward those after seeing what we found ahead of us. After only about a tenth of a mile of traversing, we hit a small snowfield, and the group, which had become a bit scattered during the traverse, got back together to start the descent. 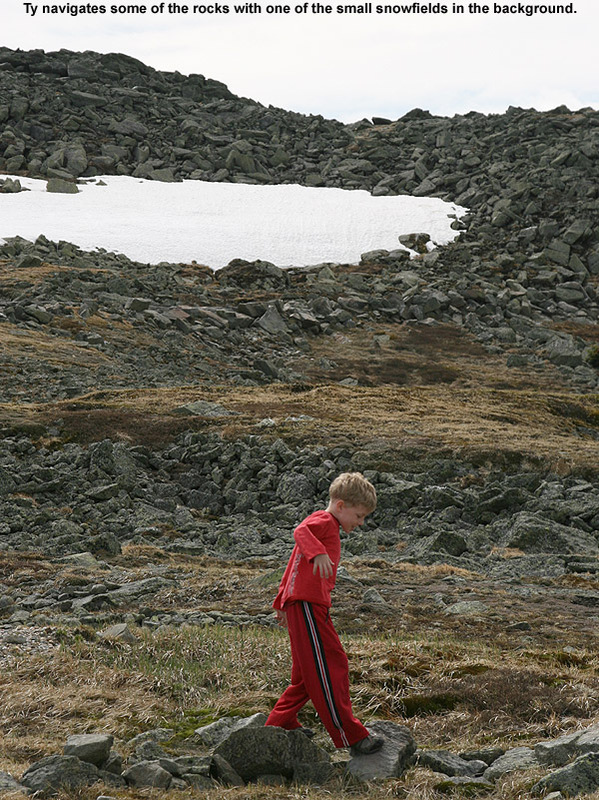 That first snowfield was moderately steep, perhaps in the 30 degree range or so. 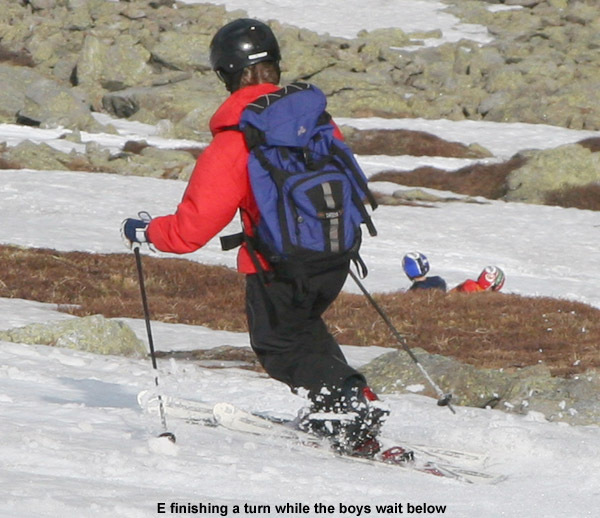 Since it was steep and rather short, the boys decided to wait until one of the bigger snowfields to start skiing. They opted to simply do some sliding on the snow. E and I mentioned that it was likely to be easier to ski than slide since they would have edges to control their descent, but they were having fun. 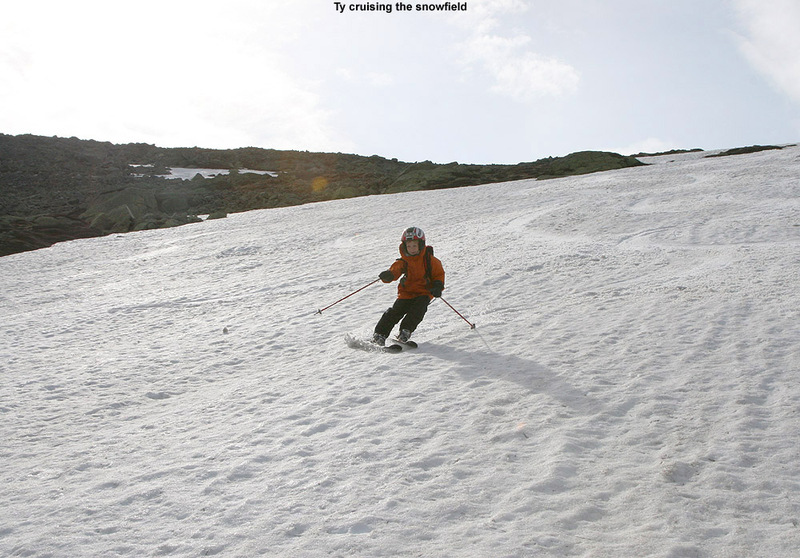 E and I skied the snowfield, and then we all traversed over to a much larger snowfield off to the north. 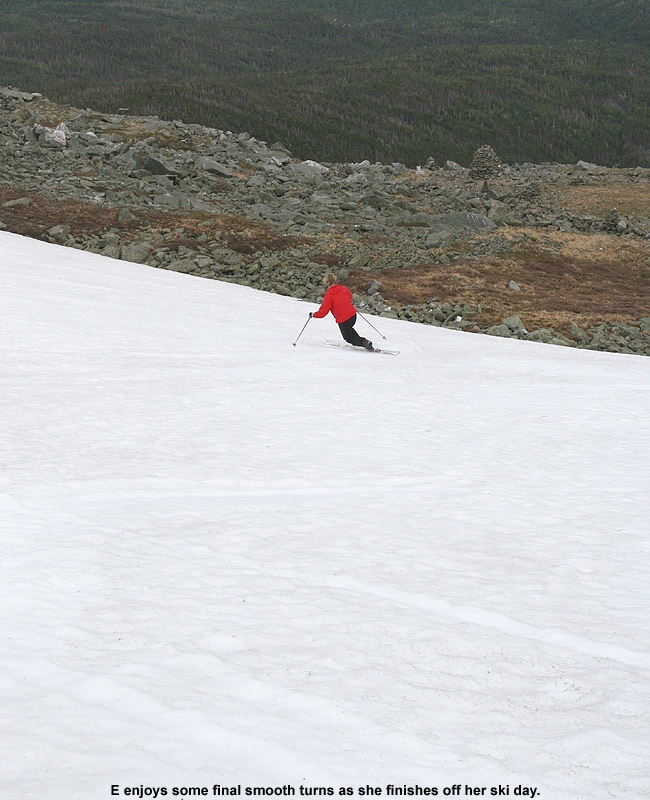 When we’d arrived at the initial snowfield, there had been a couple of people skiing laps on the edge of the larger snowfield below, but by the time we got there they were gone, and we had the whole thing to ourselves. 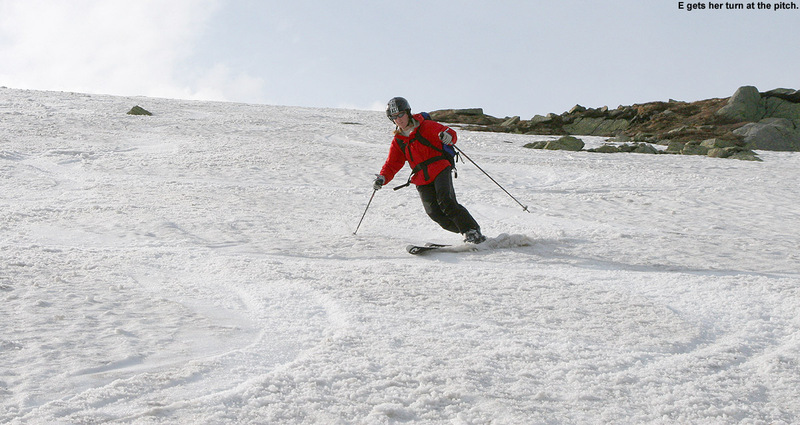 In fact, they were the only people we’d seen on any of the snowfields in that area. 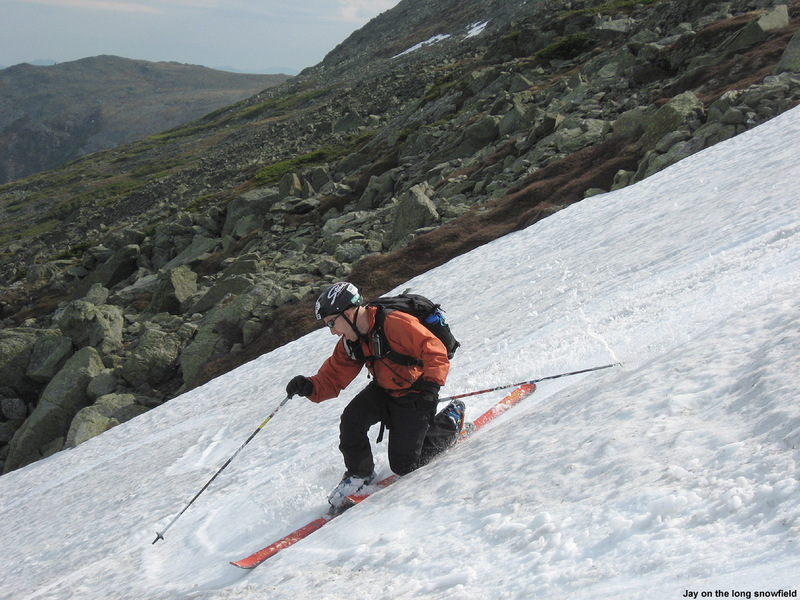 We were surprised by the lack of people since it was Memorial Day weekend, but perhaps everyone had already done their skiing the previous weekend. The weather continued to feature interludes of sunny and cloudy periods, and although we’d seen what looked like thicker clouds and showers off to the Green Mountains in the west, no precipitation materialized in our area. 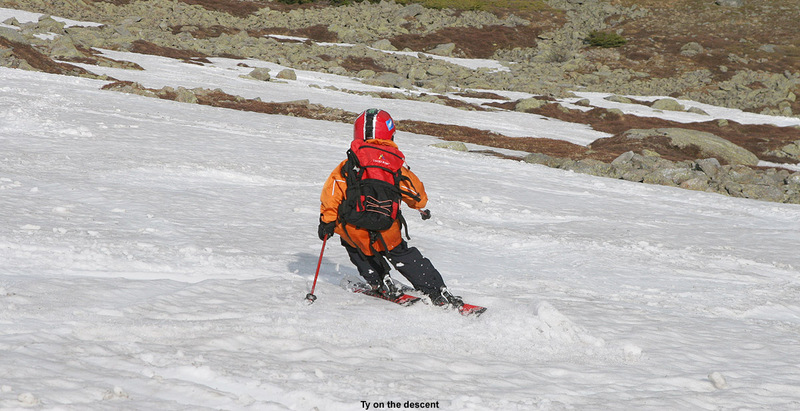 Ty and Dylan were the first to ski the larger snowfield, and it was fun to watch Dylan follow Ty through the terrain. 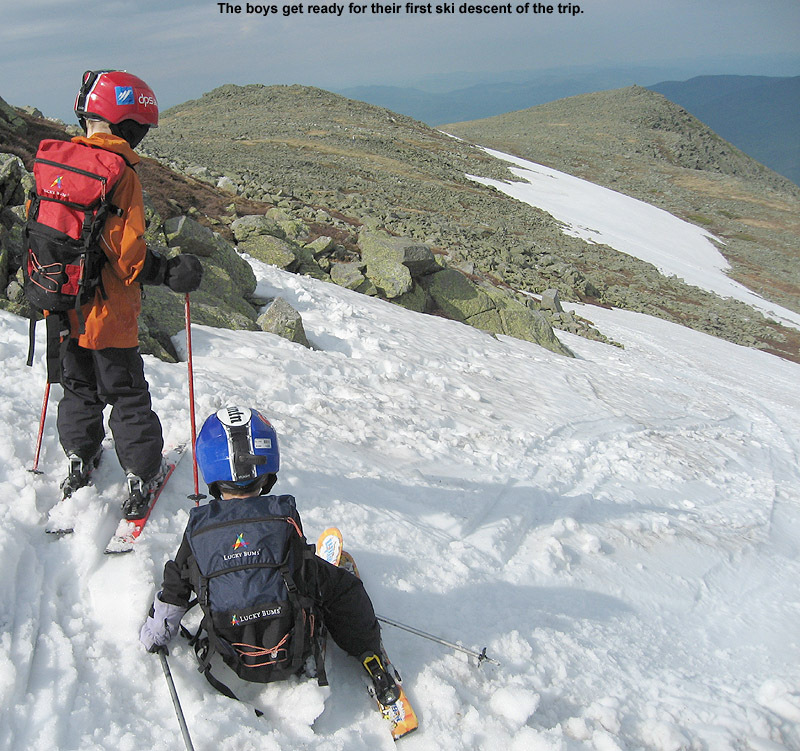 The snowfield wasn’t quite as steep as the first one, and it was a fun experience for the boys to have the whole face to themselves with the ability to decide what route they wanted to take. The boys stopped about 2/3 of the way through the descent to wait for us, then E joined them, and I skied all the way to the bottom to get some pictures from below. From the bottom of that snowfield we traversed north and slightly upward to another snowfield section that was connected to the first. 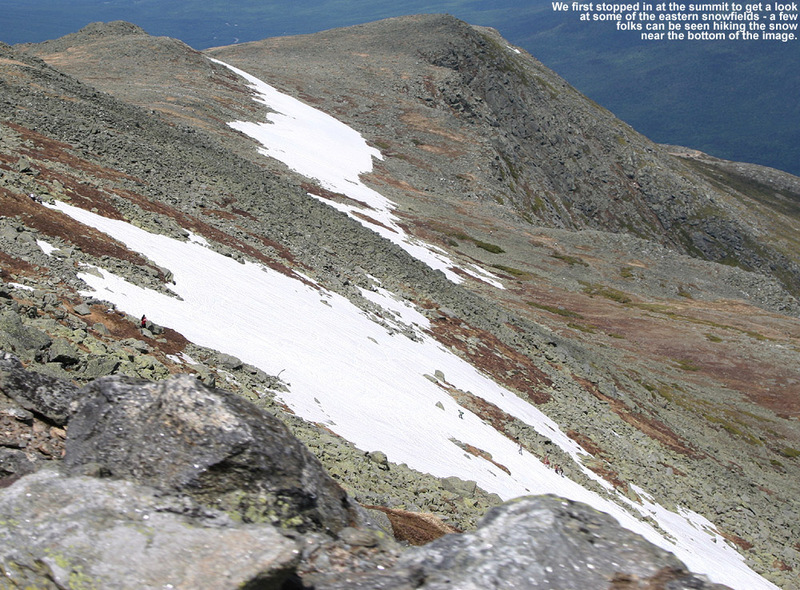 At that point we were on the long collection of snowfields that sits above Huntington Ravine. The next section of snow didn’t provide quite as much vertical drop, but it didn’t seem like it had seen any skier traffic in quite a while, so it was extremely smooth. I made a boot ladder that was spaced well for the boys, and we hiked up to the top of that section. 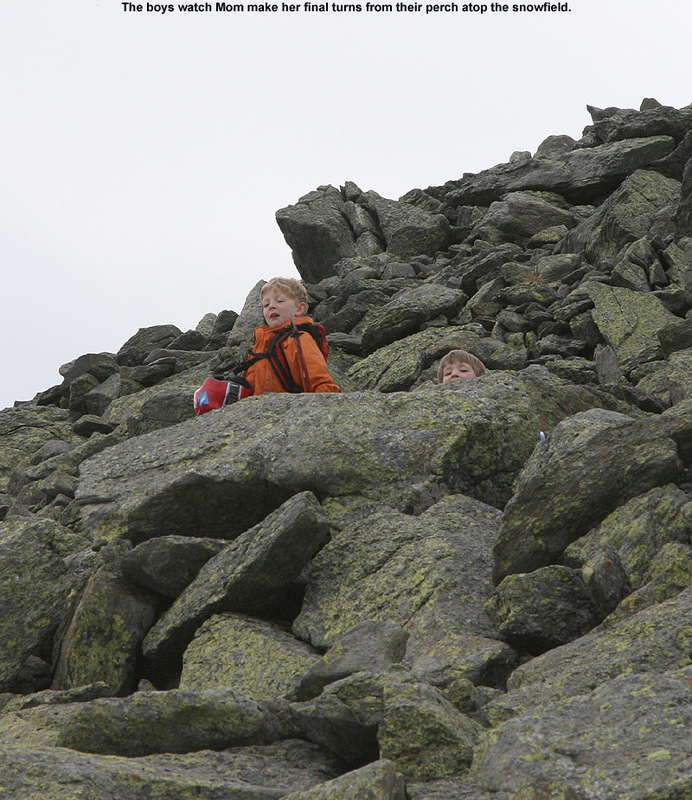 The boys had been happy with their earlier turns, and were most excited to play on the rocks and stairs of the Huntington Ravine Trail, so they switched back to their hiking boots and played around while E and I did a bit more skiing. Those turns were a lot of fun, and E got the time she’d been looking for that let her practice and dial in some smoother Telemark turns. I hadn’t really been following the recent freeze thaw cycles up on Mt. Washington prior to our outing, but looking back at the Mount Washington summit weather archive, it says that the lows for the two nights before our trip were only down to 35 F, and the nights prior to that were even warmer. 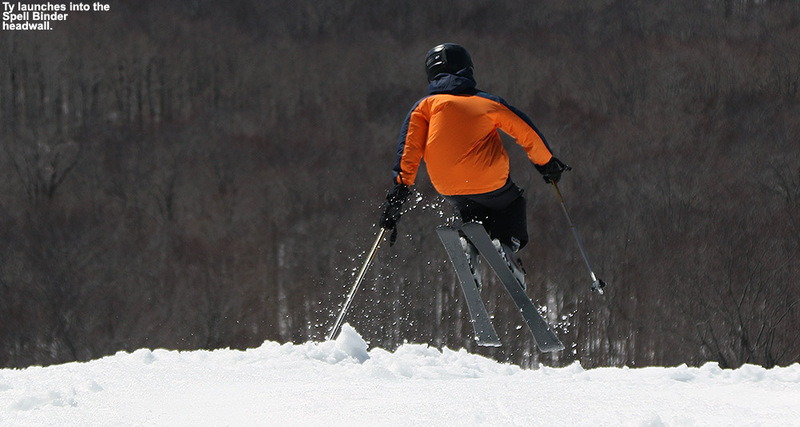 Apparently, once the corn is formed, it doesn’t necessarily matter if the temperatures go below freezing nightly or not in terms of maintaining quality conditions for spring skiing. We never encountered sticky, rotten, or mushy snow, just good corn with a peel away layer on the surface. 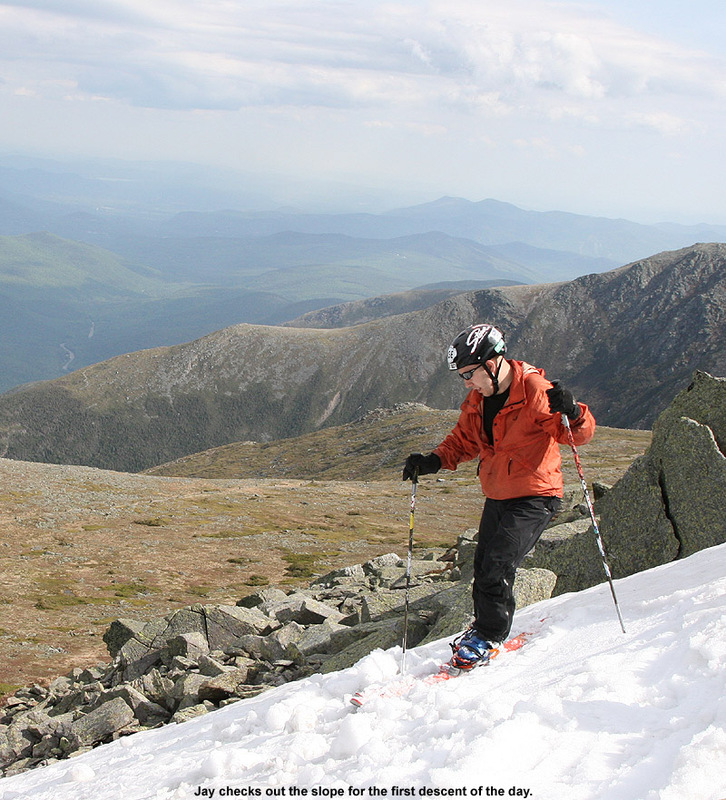 I’m sure it would have been much less enjoyable for the boys if the snow had been difficult, but thinking back, I can’t recall any really tough snow in our Mount Washington outings at this time of year. Perhaps the snowpack is dense enough by this point in the season that freezing cycles aren’t as critical. It was only a few minutes of hiking to get back to the car from there, and it really had been an efficient outing; for all the skiing we’d done, it had only required about ¾ of a mile worth of total travel. Although I’m sure Dylan was a bit tired, both boys were still bounding around on the final leg back to the car, so the distance had clearly been good for them. Just as we were about finished changing clothes and packing the gear back into the car, one of the Auto Road vans came by and let us know that he was the last one heading down. It was just about 6:00 P.M. by that point. We didn’t dawdle on the way down so that we wouldn’t hold up the final van, but there were plenty of people still out of their cars below us as we passed by, and even a pair of hikers just below our parking area that seemed to be making their final descent via the road. 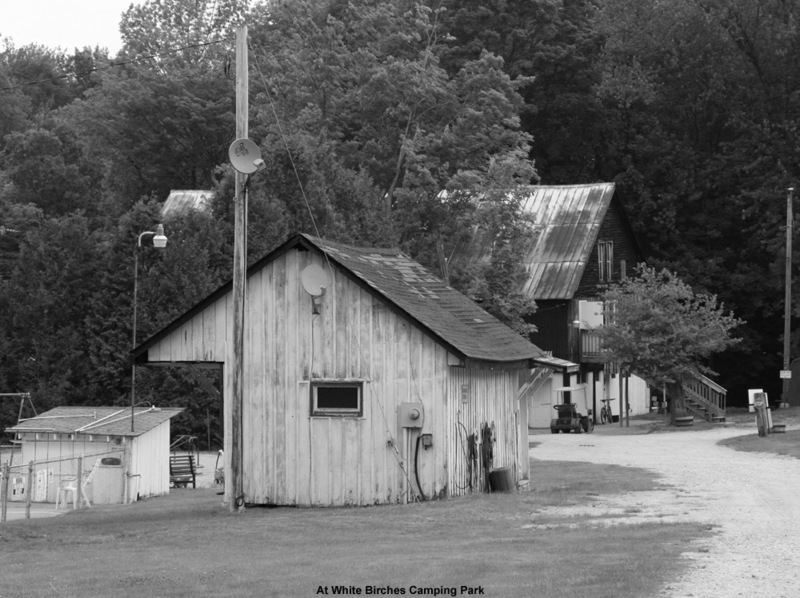 After an enjoyable Auto Road descent with more fun views, we headed over to Shelburne, NH and checked in at White Birches Camping Park. 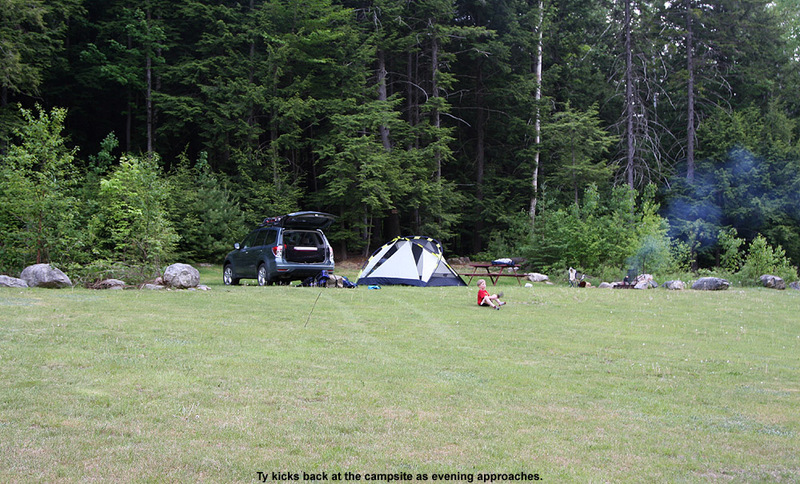 We’d reserved a grassy site, and they’ve got some nice ones right on the edge of an evergreen forested area that contains access to the Shelburne Basin Trails. The evening’s burgers were some of the best in a while, and there were no complaints from me when Ty couldn’t quite polish his off burger or sausage. In the morning, we had some breakfast and broke camp, then the boys went off with E for a while to go swimming and play on the campground’s equipment while I worked on repacking the gear. The weather was still nice, so we decided to take a circuitous route home and see some sights. 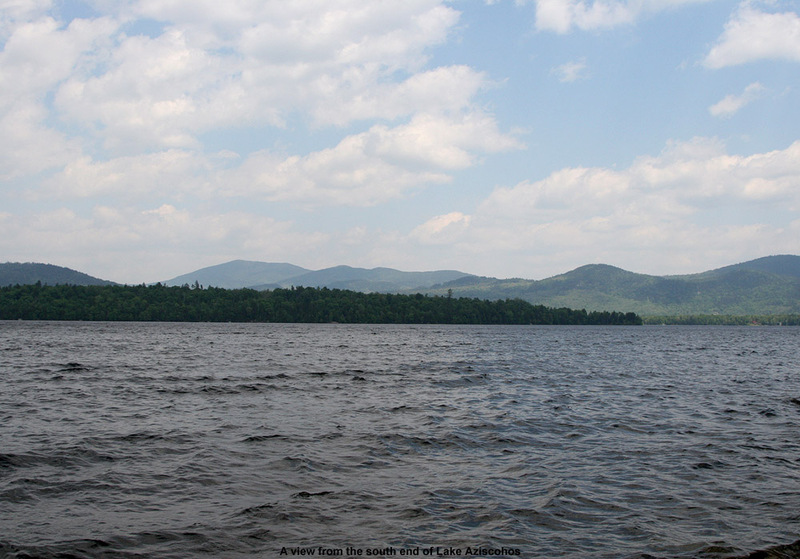 We headed back to Gorham, then north along the Androscoggin through Berlin, past Umbagog Lake, and up to Lake Aziscohos. North of Berlin, we were certainly in the land of lakes, loons and logs; houses seemed just as likely to have a loaded logging truck in their yard as anything else. Between the abundance of big rivers, dams, and lakes, it’s quite a water paradise. We saw several groups of flat water and whitewater boats, and lots of fly fishing taking place. At Aziscohos we were getting close to the Saddleback/Sugarloaf zone, although we didn’t head quite that far into Maine. 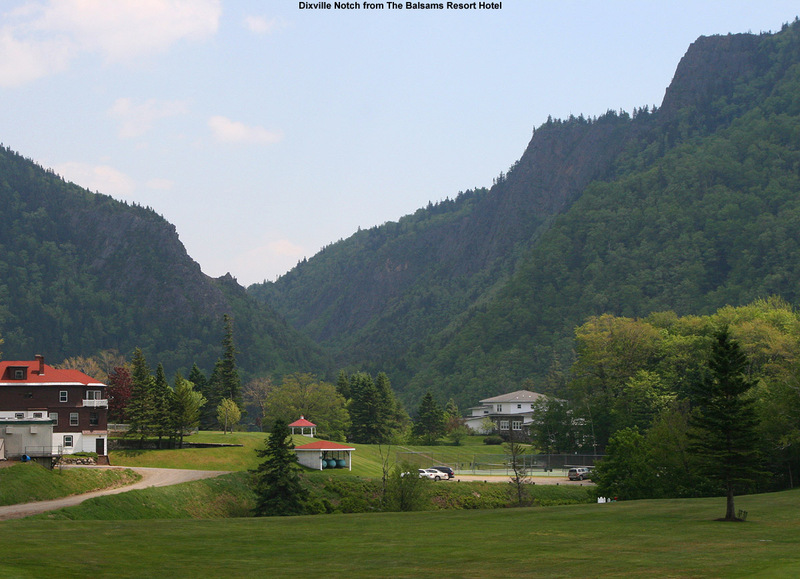 After lunch at the picnic area on the south shore of Aziscohos, we headed west through Dixville Notch and got to take in its impressive craggy views. 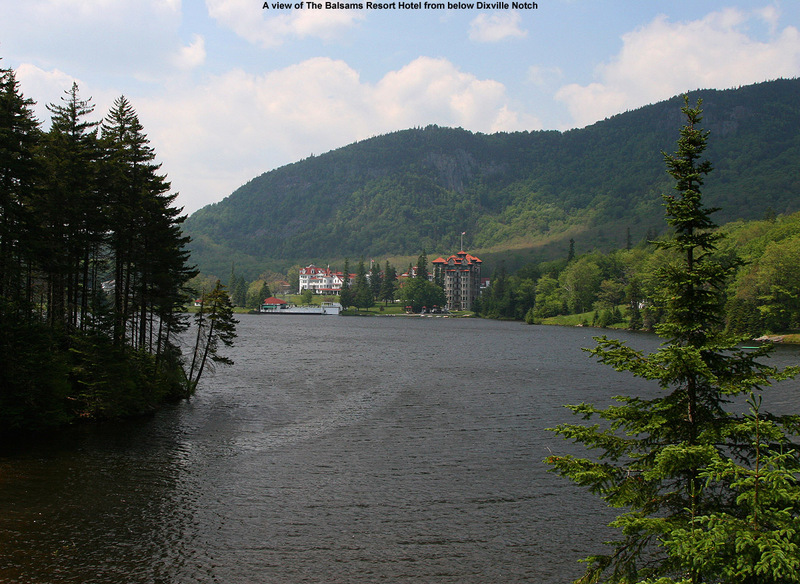 We also stopped in to check out The Balsams Resort Hotel and The Balsams Wilderness Ski Area, which we’d never visited before. The ski area isn’t huge, offering just over 1,000 feet of vertical, but from everything I’ve heard, it’s very much the type of ski area we enjoy. 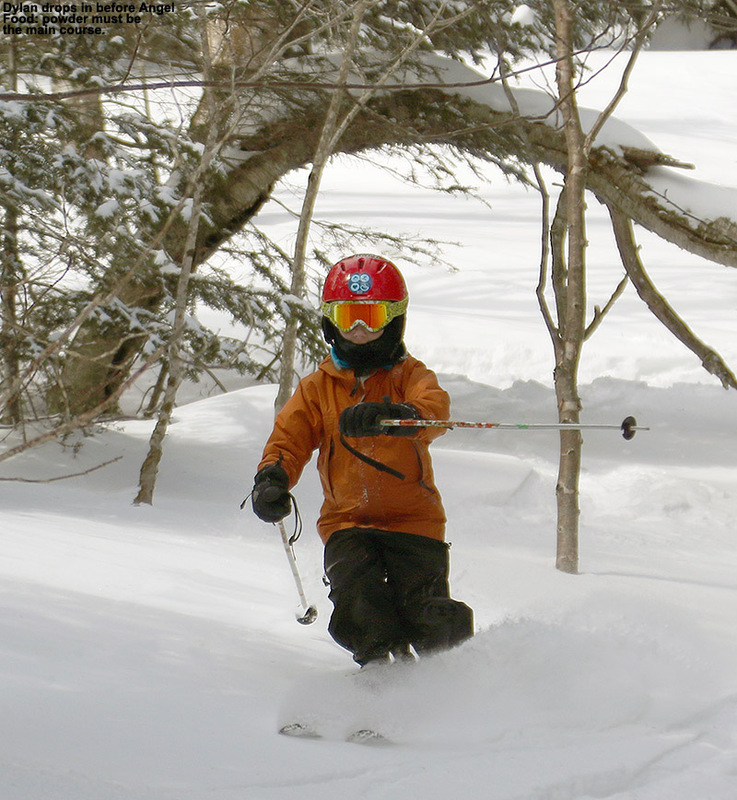 Akin to some of our favorite local ski areas like Lost Trail Powder Mountain in Montana and Bolton Valley in Vermont, it’s got low skier traffic, low speed lifts to keep it that way, and decent snowfall. 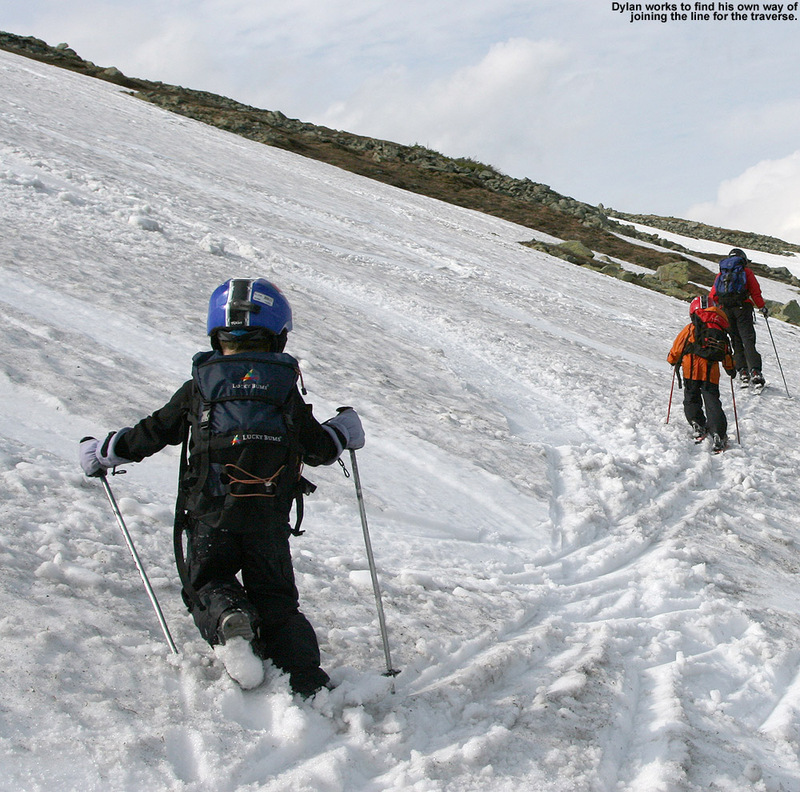 Wilderness doesn’t quite get the 300+ inches of annual snowfall that Bolton and Lost Trail do, but knowing the snow trends for northernmost New Hampshire, I suspect they do decently on snow preservation like Saddleback and Sugarloaf. 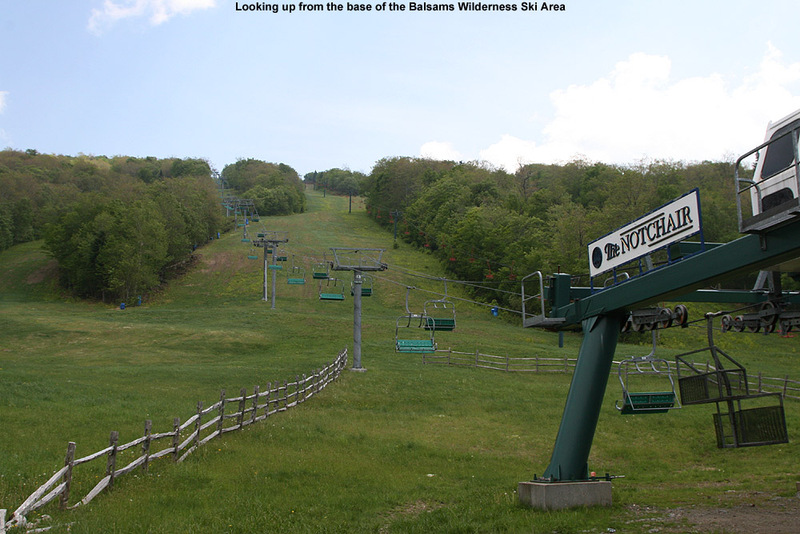 Based on an article I found by David Shedd on easternslopes.com[SJ2] , it sounds like minimal skier traffic helps out in maintaining the powder and general snow quality as well. The 1,000 feet of vertical at Wilderness is said to be nicely sustained, with no runouts, and that was definitely the impression we had when we drove to the bottom of the lifts and looked around. 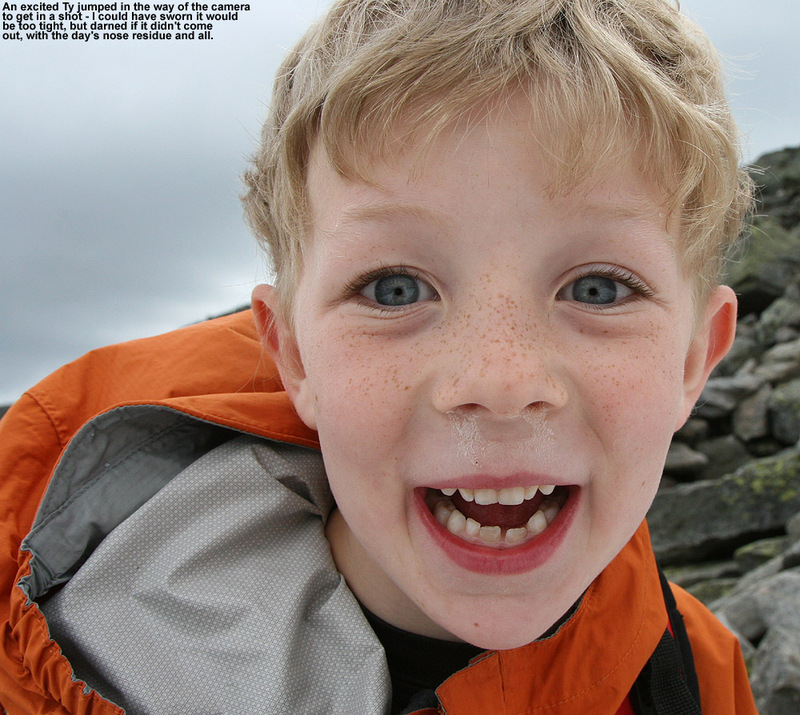 E and I have been thinking it would be nice to do a ski trip coupling Wilderness, Saddleback, and Sugarloaf together. Of the three areas, we’ve only been to Sugarloaf, and only in the spring. 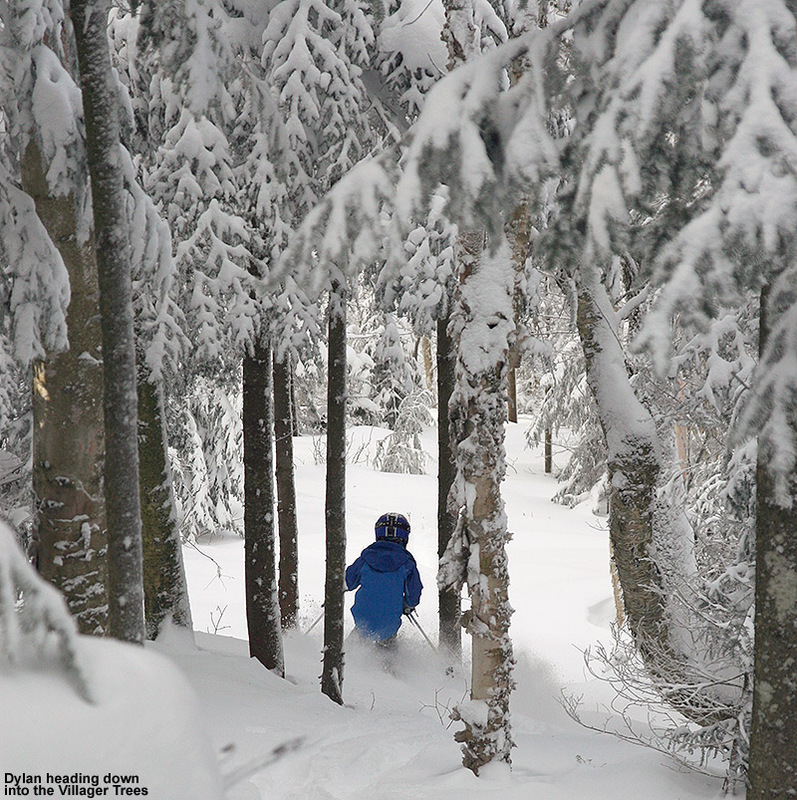 It’s usually hard to leave Northern Vermont’s snow during the middle of the ski season, but a good time to go east would be when one of those storm cycles comes through that focuses on Northern New Hampshire and Western Maine. 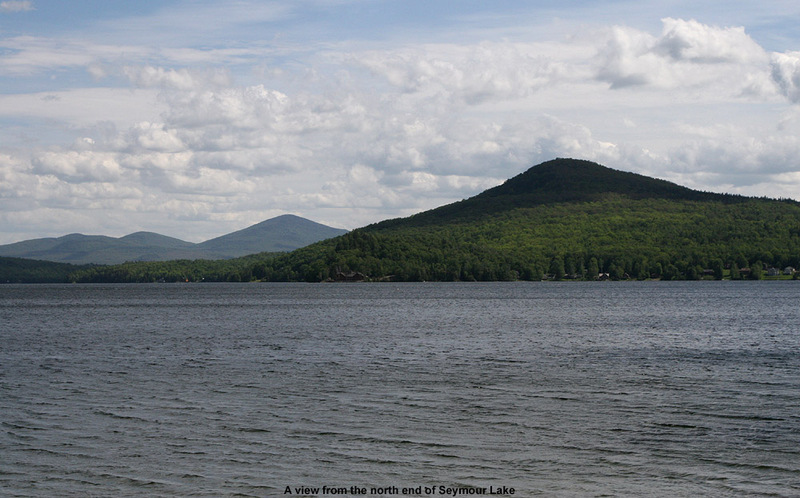 We got back into Vermont in the far northeast part of the Kingdom, and took the northerly route to I-91 along the Canadian border past Wallace Pond. It’s not a huge body of water, and it was fun pointing out to the boys that the houses just a couple hundred yards away on the other side of it were actually in Canada. We also passed Great Averill Pond, Norton Pond, and finally Seymour Lake, where we stopped for a few minutes. We went through Derby, but didn’t quite get up to Derby Line to show the boys how the library/opera house is split by the international border. At some point we will have to get them up there. 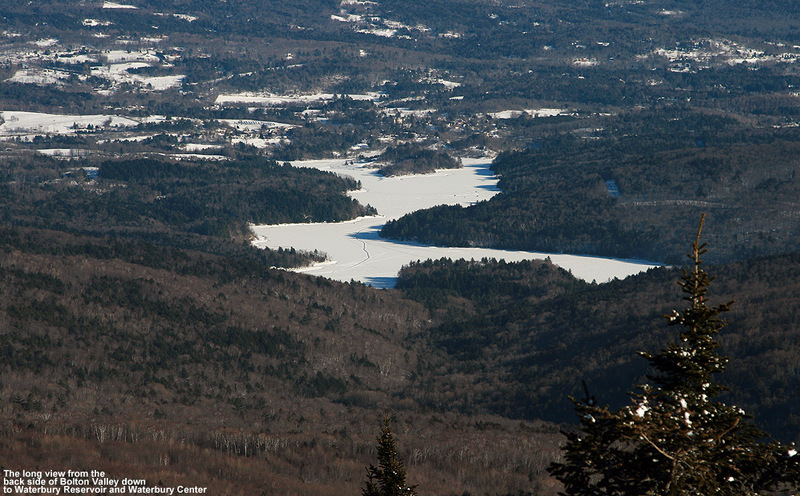 Once on I-91, we were pretty quickly back in our own neck of the woods, and I’d say one of the more surprising things that we discovered was how close Balsams Wilderness Ski Area is to our location. Being so far north in New Hampshire, and mentioned so infrequently, it seemed to be on another planet. But, barring horrible road conditions, it should only be two to three hours from Waterbury. After our visit to the area, it has certainly moved up higher on my hit list. 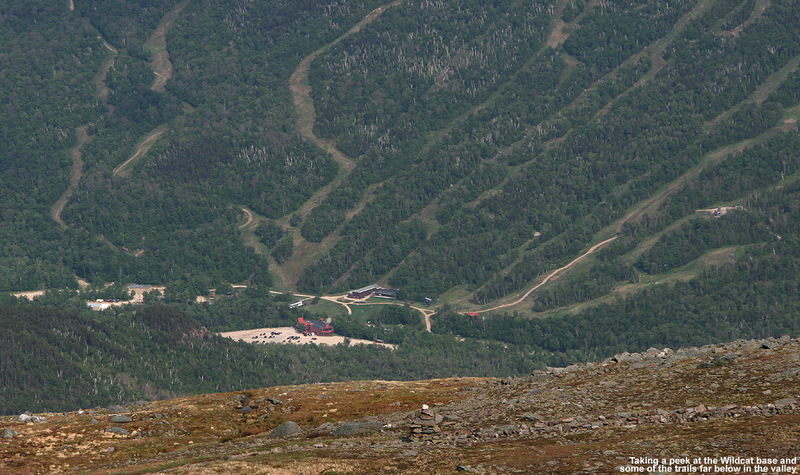 Below I’ve added a web cam image of the east side of Mt. Washington from last weekend, showing the various areas of snow that were present at the time. 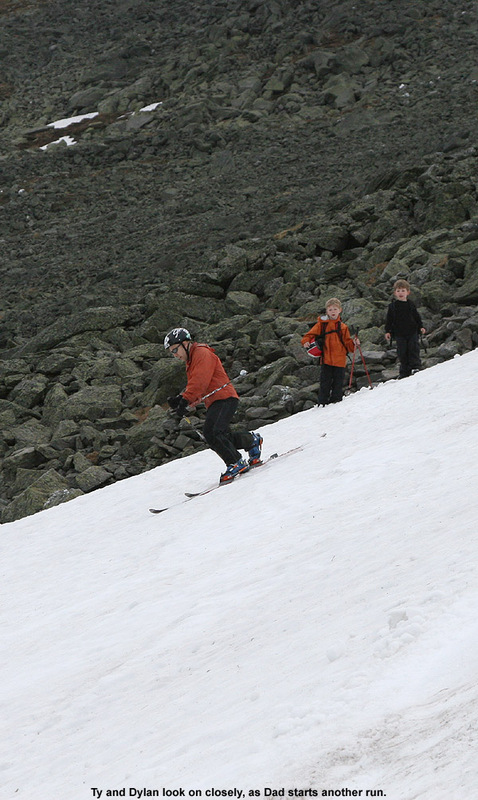 The longest runs up near the summit still seemed to be off the main east snowfield that we didn’t visit. We haven’t had any of the hot temperatures that we had the week before our visit, and things have been much more seasonable, so there should still be some decent easy access skiing up there at this point. 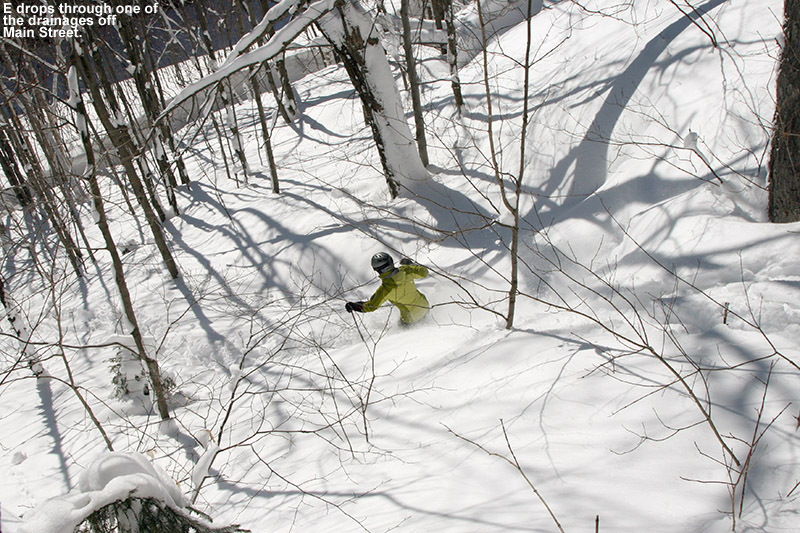 Click through temporarily for integrated images in the report at SkiVT-L.
With the way it continued to snow into Sunday evening, along with the expected cold temperatures, it was likely that Monday was going to feature more powder skiing. I headed up to Bolton Valley in the morning, and while there was no snow at the house (495’), I was surprised at how quickly I saw the first traces of snow as I headed up the access road. The first coatings of snow appeared in the woods around the Bolton Valley welcome sign, even below 1,000’. The snow depth increased fairly quickly at first, and there was an even coating of perhaps a few inches up at the Timberline Base (1,500’). The increase in snow beyond that elevation was unimpressive though, and I was very surprised by the appearance of the slopes up above the village (2,100’). 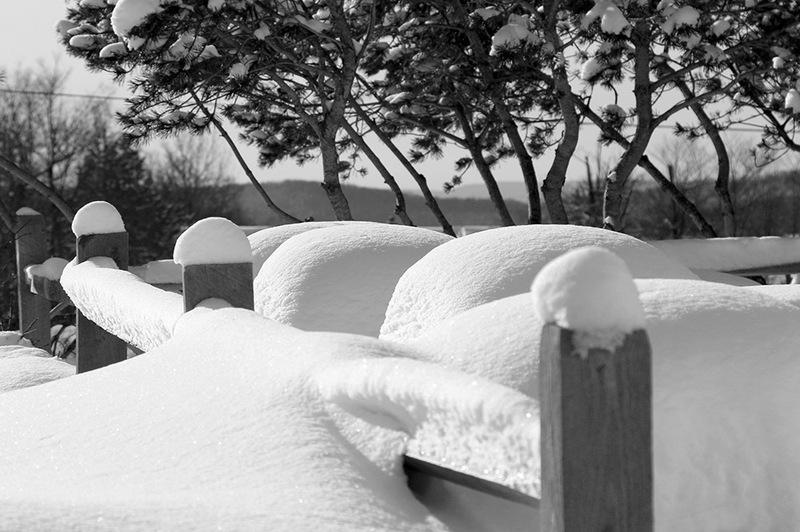 On initial inspection, it seemed like the mountain had picked up just a few inches of new snow, and what they had received had been scoured out in many places by the wind. The snow was certainly skiable, but it really looked more like junkboard territory, nothing like what we’d seen the previous day at Jay Peak. The weather was inspiring in a ski sense though; it felt like November with a temperature of 28 F, very dry air carried on a light breeze, and a few remnant clouds between me and the skies to the west. I decided to take a quick walk around the base area and see if I could spot any inspiring areas of more respectable powder. I couldn’t convince myself that there was anything I wanted to hit over by the Mid Mountain Lift, but I finally saw some protected areas over by the Snowflake Lift that looked nice. I grabbed my gear and started skinning up Lower Foxy. Although certainly less than the 6”+ we’d seen at the Stateside base of Jay Peak, once on the snow I could see that Bolton had received some decent accumulations where the winds hadn’t completely had their way. With grass sticking out of the snow in most places, the view was less inspiring than what we’d seen on Sunday, but my checks revealed 3” – 6” of accumulation, which was generally dense and more than enough to keep me off the ground. In fact, there was an upper layer of lighter powder on top that seemed to be derived from some drying of the snow and/or the tail end of the snowfall. 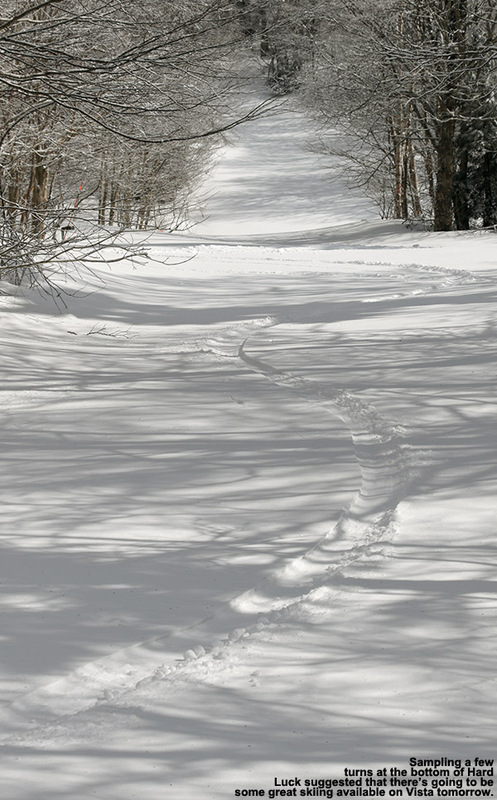 I skinned up to the top of the Snowflake area (2,400’), then connected over to Cobrass Run and continued up to the 2,600’ – 2,700’ range on Cobrass, where I found 6” – 8” of snow. Since the clouds had almost completely pulled away to the west, I enjoyed some excellent views of the Champlain Valley and Adirondacks, and Whiteface stood out clearly. 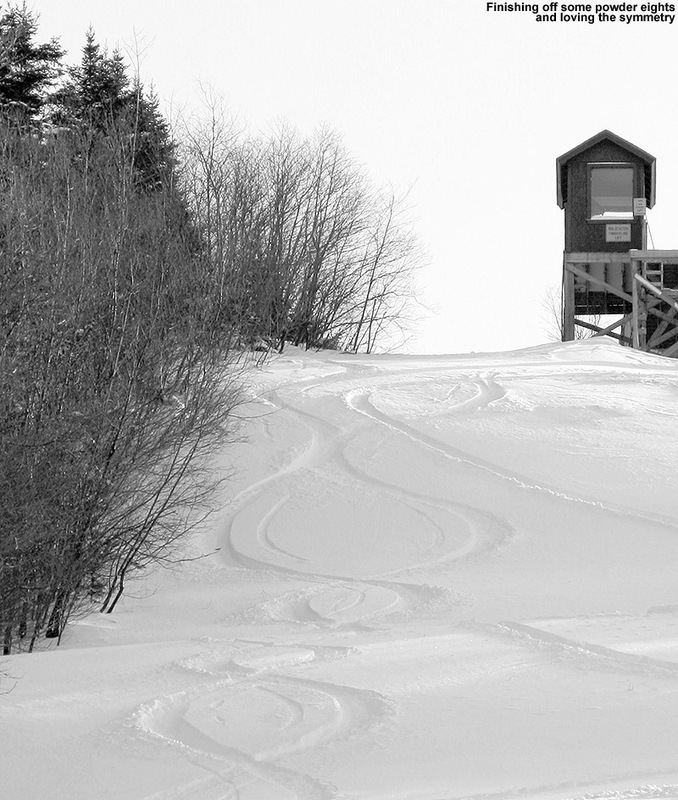 I had to think a little in choosing my descent lines, but managed some great powder turns on parts of Cobrass Run. There were some really smooth and dry areas of snow up there, enough that I would have stayed and gone for another run higher up on the mountain if I’d had the time. Down in the elevations of the Snowflake area it was harder to find that nice powder; the snow was generally on the denser side of the spectrum without the extra topping. Overall on Monday at Bolton there was some good powder, and lighter powder than some of the April/May shots of snow we’ve had this spring, but for the overall experience I’d put it near the bottom of the collection of days in the period simply due to the lower coverage. 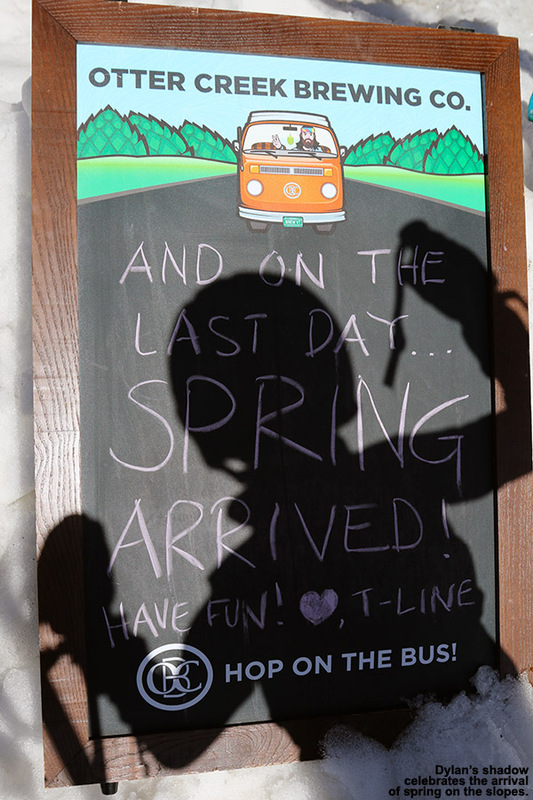 Thanks to some of our local forecasters, we had about a week’s notice that a potential Mother’s Day Snowstorm was on the way, so there was plenty of time to get ready for it. The cold air was expected to be pulled into the storm system by Saturday evening, and that would get the snow going. It looked like the snow line was going to be around 1,000’ for the event, although by Thursday morning the Burlington NWS mentioned the potential for a bit of accumulation even in the lower valleys. 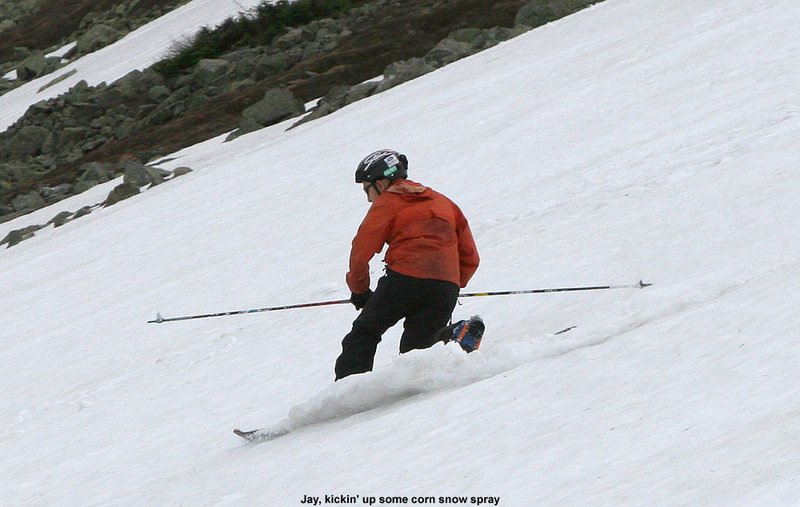 Roger Hill also gave SkiVT-L a heads up on Thursday, indicating that there was going to be new snow for skiing over the weekend. Saturday and Sunday were a bit of a weather roller coaster in Waterbury. On Saturday afternoon a summery thunderstorm passed overhead, and we even got a bit of hail from it. By Saturday evening though, I checked the real time temperatures atop Mt. Mansfield, and saw that they had already gone below freezing. With precipitation in the area, the mountains were probably well into the snow by that point. I wasn’t sure what to expect down at our elevation the next morning, but when I looked outside at around 6:00 A.M., it was snowing and we had a coating of white accumulation on the elevated surfaces. By that point we’d picked up a couple tenths of an inch accumulation and it continued to snow. The snow waned for a bit and the temperatures edged up, but at some point after 8:00 A.M., there was a big resurgence in snowfall and we started to get more substantial accumulation. I checked the local radar and could see an ominous-looking mass of moisture heading our way from the north-northwest. We hung out, had some Mother’s Day breakfast, watched the snow fall, and generally took it easy for much of the morning. I had initially thought that we might need to get out early to get some good powder before the day warmed up, but with the way the storm was raging in the mountains, being an early bird wasn’t necessary. In the late morning we drove northward to Jay Peak. By that point, only minimal accumulations of snow remained in the relatively low valleys from Waterbury through Morrisville, but once we got near the Northeast Kingdom in the North Hyde Park/Eden area, the accumulations really shot up. Snow was even accumulating on the road as we passed through Belvidere, and up on Route 242 in the final leg of our trip, there was so much snow on the road that plowing was necessary. 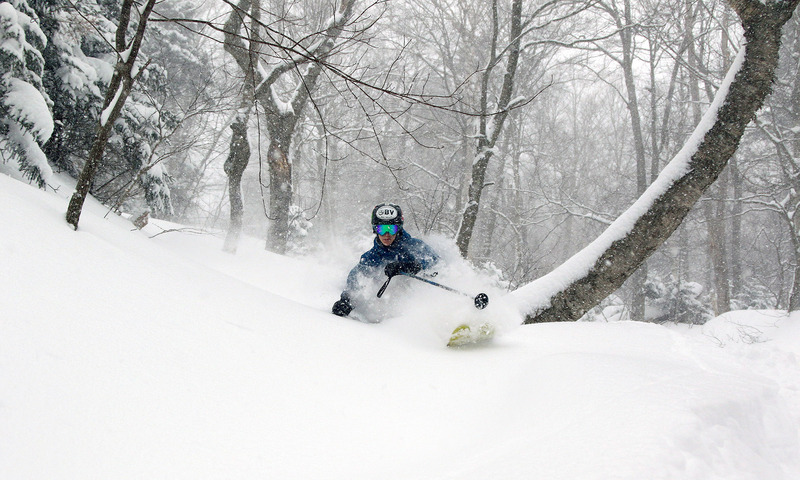 A bit after noon, we pulled into Jay Peak’s Stateside lot at an elevation of roughly 2,000’ and were confronted with a veritable blizzard. 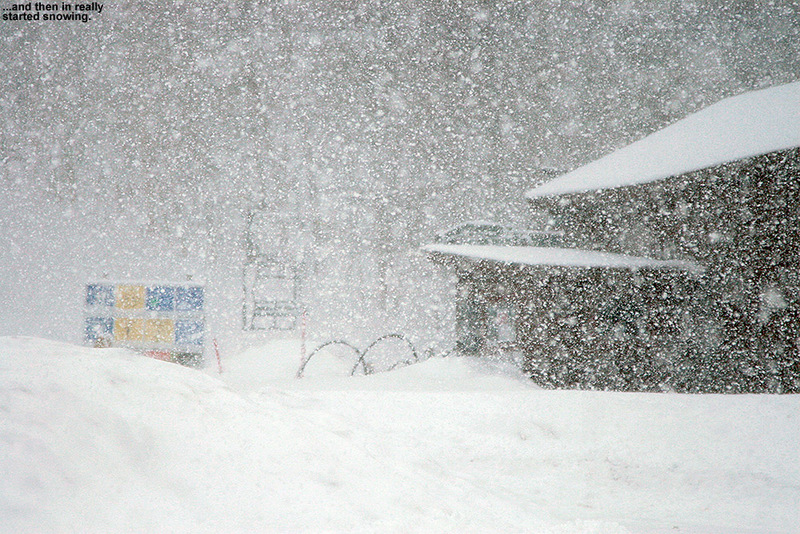 It was snowing hard, and winds were gusting to 40 MPH. 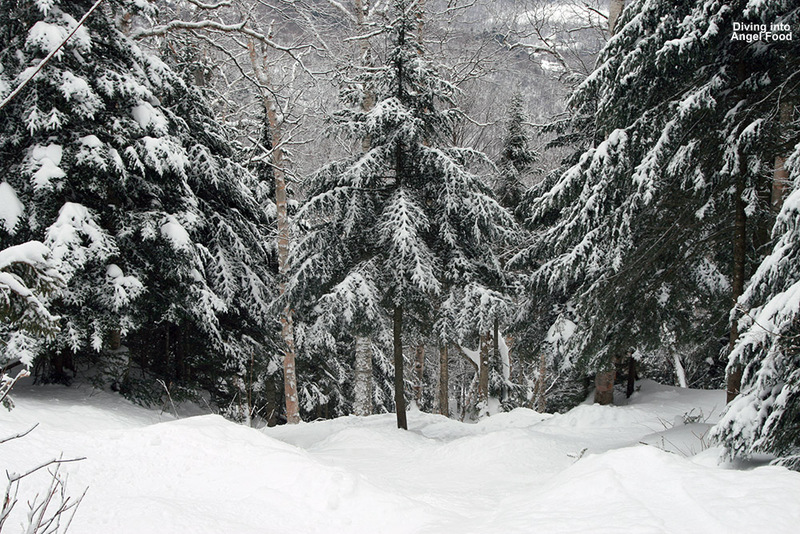 We saw a snowboarder who had just come down from a run, and he said conditions were great – except that it seemed like you were hiking directly into the wind. 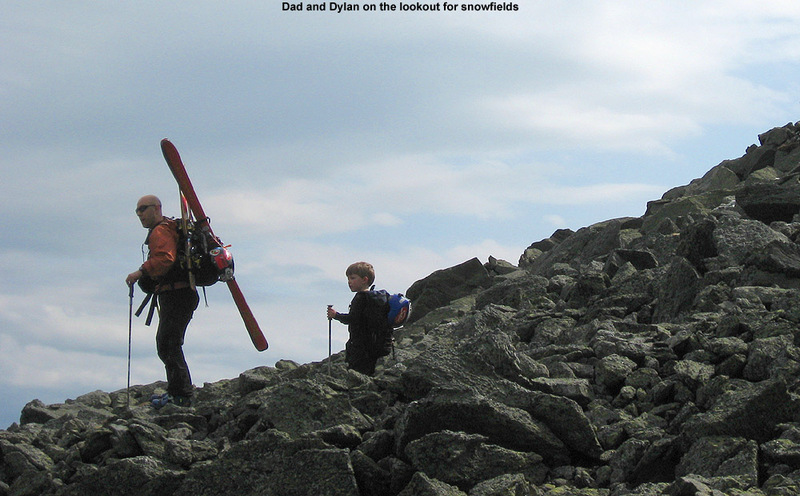 E suited up, and helped get Dylan into his gear, but Ty apparently wasn’t in the mood to ski. 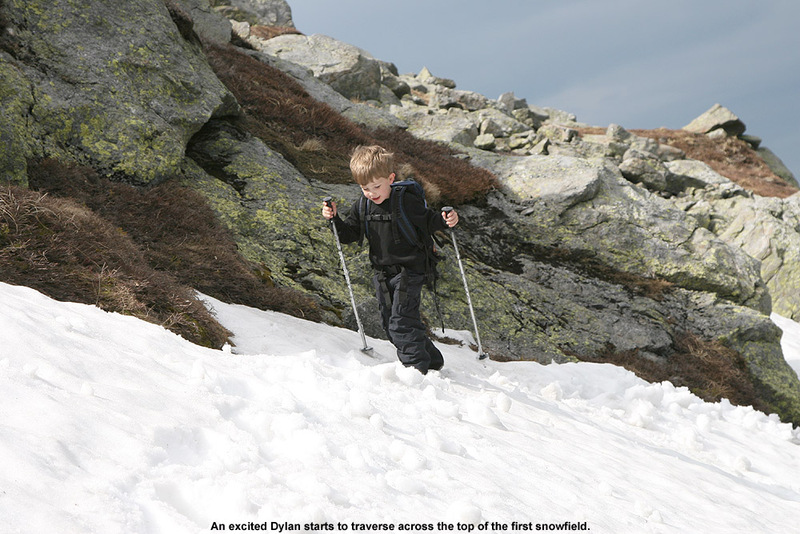 While we talked about options for a bit, Dylan eventually lost his momentum as well, and decided that he didn’t want to hit the snow either. I guess I can understand how the boys might have been put off from heading out into the maelstrom – going almost directly from spring to an all out blizzard must have been pretty strange for them. I offered to hang out with the boys and let E head out for turns, but she said she’d rather hang out with them than head up by herself, and said that I could go do a run. I finished getting my gear together and skinned up for a quick run in the Chalet Meadows area. Aside from some wind-scoured spots, I measured anywhere from 4 to 18 inches of new snow on my ascent, although I guess I’d put the average accumulation at somewhere around 6 inches plus. The snow was dense, but not wet except for in the water bars or other low spots. 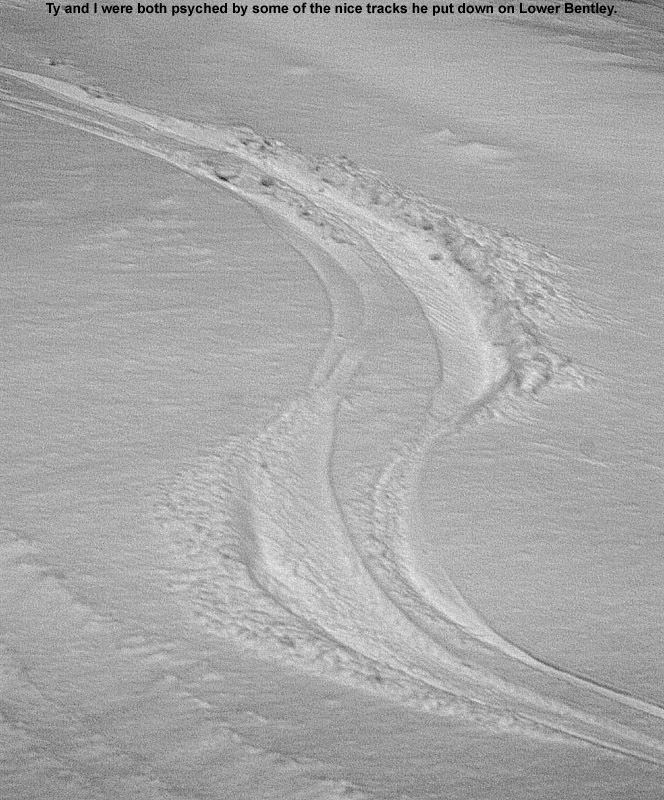 It certainly skied like dense snow, and was a bit tricky, but a lot of that was due to the variability of some spots having wind crust and other being softer. There was so much dense snow there was no need for rock skis; I wished I’d brought some newer, fatter skis because they may have made things even a little easier. Our plan had always been to do a bit of skiing and then drive around in the car and find a new place for some lunch/brunch. E reminded me that we wanted to take a look at Jay Peak’s new Tram Haus Lodge before we left the resort, so we headed over to the tram side of the resort to check it out. 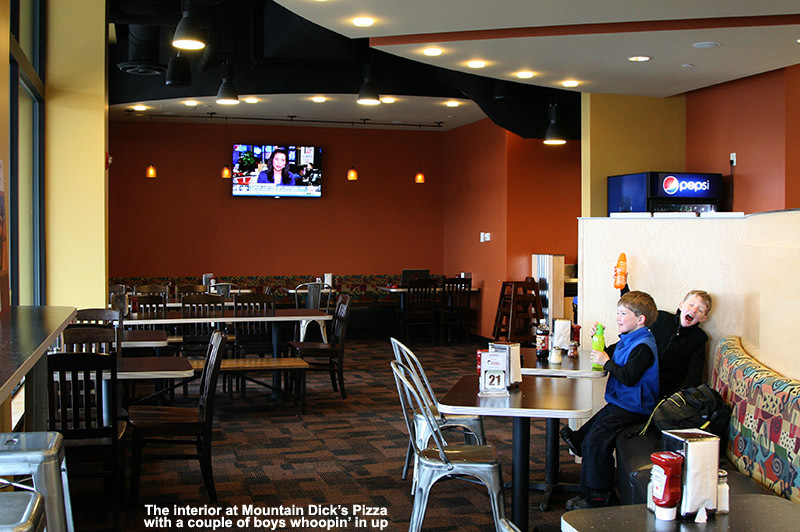 While there, we wondered if there might be a new restaurant in the lodge, so I ran inside to take a look. In fact there’s quite a nice restaurant in there called Alice’s Table. It was pretty busy with Mother’s Day brunch, but after a bit of searching through her notes, the hostess said she’d be able to seat us. I told her I’d go grab the family and be right back. E was a bit concerned that we weren’t appropriately dressed for the restaurant, and while there were folks dressed nicely for Mother’s Day outings, there were also numerous folks wearing ski gear and more casual attire. 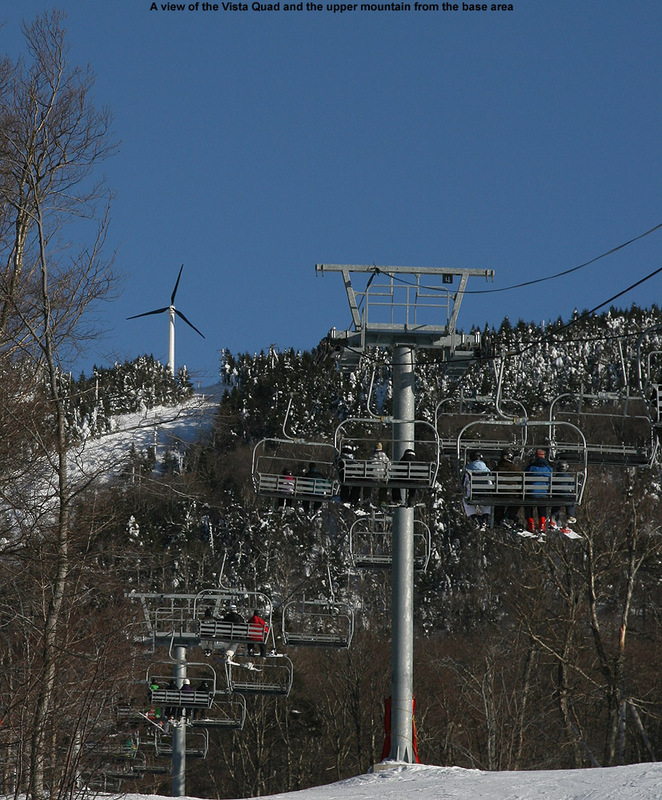 It is Jay Peak after all. The brunch buffet had some excellent food, it was reasonably priced, and the boys even ate free because of a Mother’s Day special. After bunch we hurried back to the car through the storm. We were all set to head home, but brunch had given Ty renewed energy and he wanted to ski. 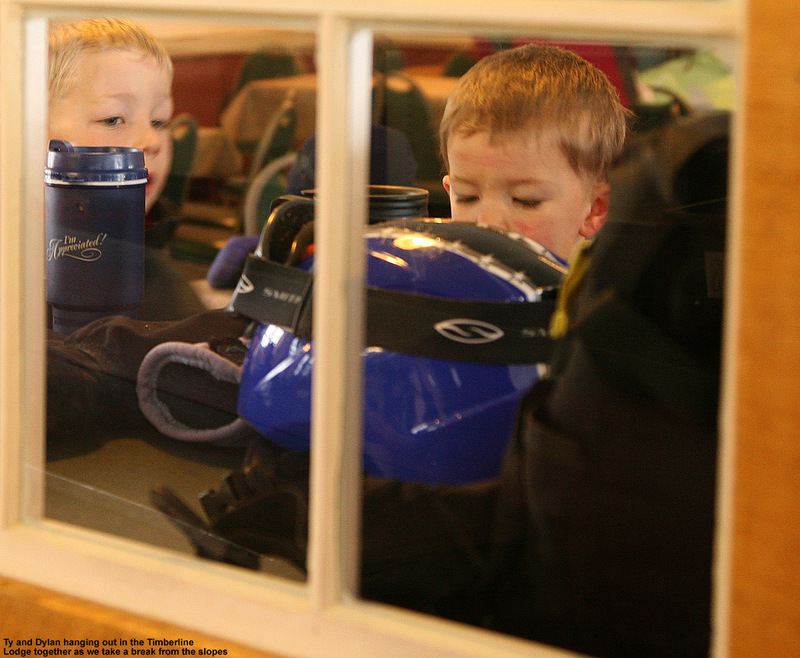 Dylan was still a bit under the weather and wasn’t quite eager to ski, so E decided that she’d stay in the car with him while Ty and I headed up for some turns. I let Ty choose the path of ascent, and he chose an area over near the Boulevard Trial. 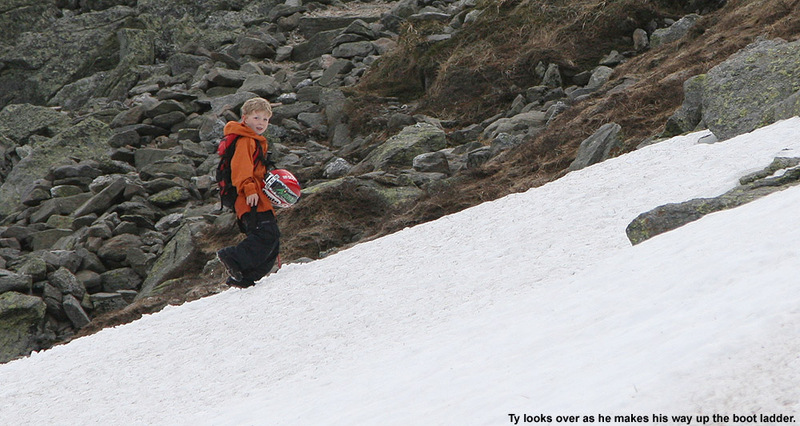 I set the skin track, and we went as far as Ty wanted to go before we stopped and prepared for the descent. With less wind over in that area, there was a pretty even coating of snow that suggested good skiing. Ty mostly paramarked on the descent, with some heel lifting, and I could see him trying to figure out the best approach to the dense snow. With this run longer than my first one, I had more time to diagnose the best technique for the skiing, which was a lot of fun. 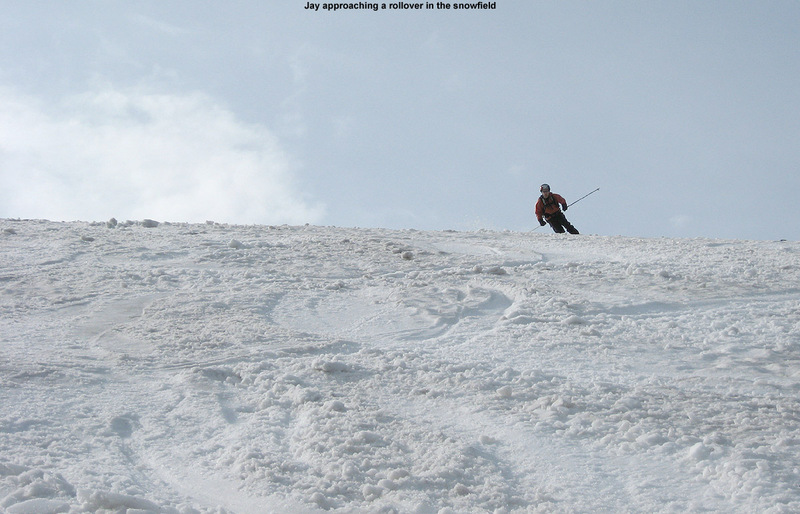 I found that staying in the top couple inches of lighter powder above any wind crusts made for silky smooth turns. 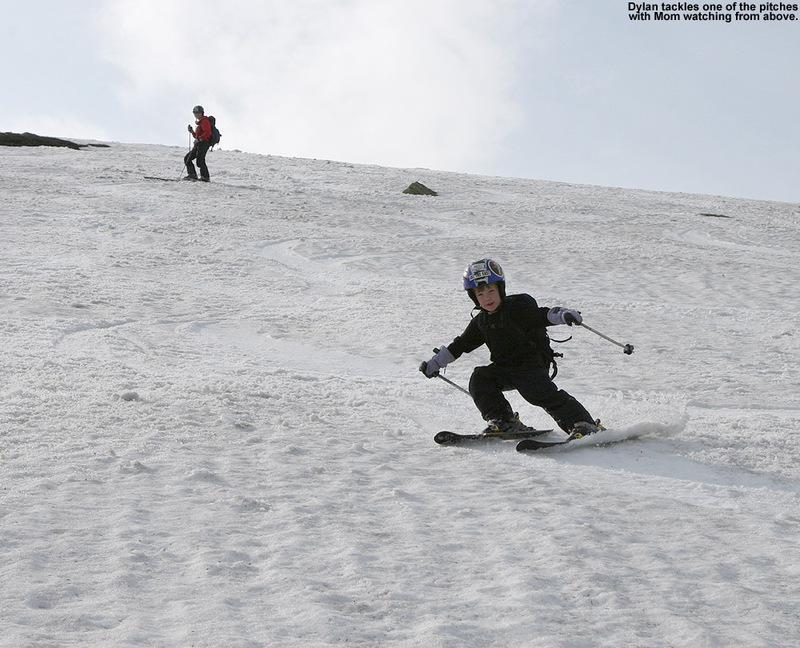 That wasn’t always possible depending on the snow and the level of pressuring, and it was obvious that some additional girth in the skis would have favored turns higher on the snow. 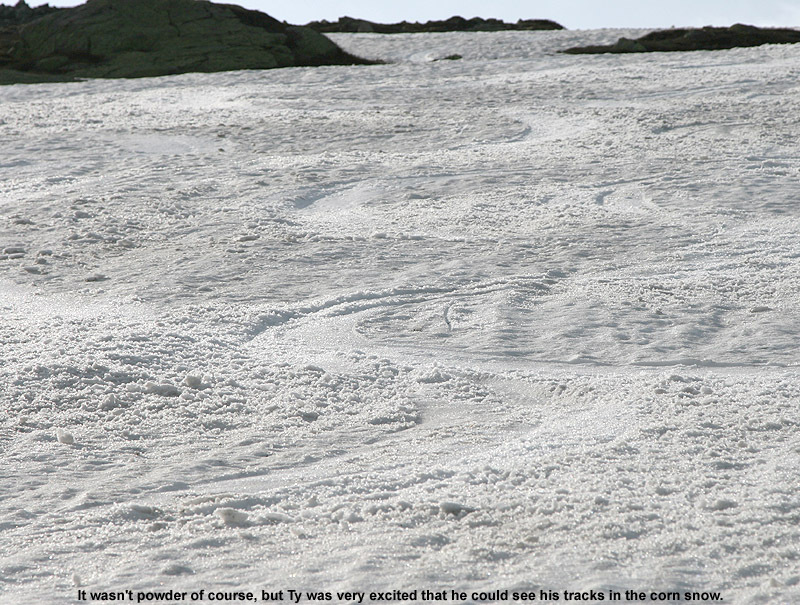 It was mid may after all though, and I did get in some great turns and had fun experimenting. 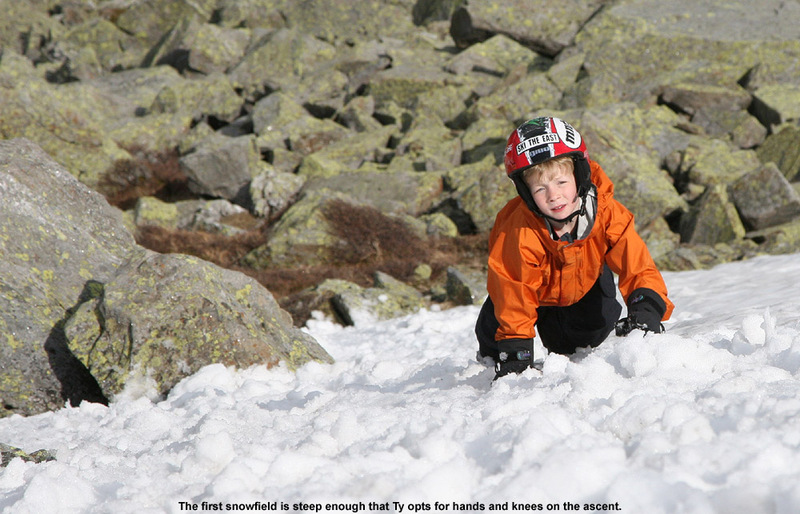 Ty actually floated better with his lower weight, although he ultimately said he was personally unimpressed by the snow. I don’t think he got quite the enjoyment out of experimenting with technique for the conditions the way I did. We both agreed that we’d try to go a bit wider with his next pair of Telemark skis. While he does use them on piste, they are definitely the tool of choice when he’s earning turns, and that often means powder snow or something of that flavor. Back at the car, I had left the ski rack open while Ty and I were out, and E said that the winds had been so strong there that they’d blow her skis right off the roof. 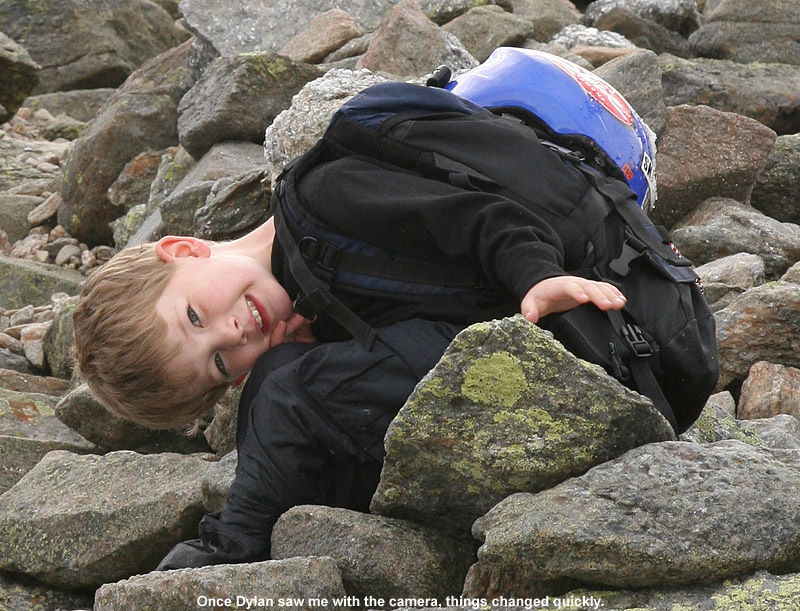 Ty and I had hardly noticed the wind up where we’d been, but Ty had chosen a good option in terms of wind protection. We geared down and got back in the car, and the winds just continued to rage with steady snowfall. It was getting close to 4:00 P.M. by that point and the storm showed no signs of caring about any sort of afternoon sun or warming. The Jay Cloud was clearly in charge of the weather. We headed down to the village of Jay on our trip back home, and in the course of about three miles and an elevation drop of a thousand feet or so, heavy winter changed over to spring. In Jay it was still snowing, but the trees were green and lush, and the ground was devoid of snow. It continued to snow all the way back to Waterbury, even with temperatures approaching 40 F in spots, but none of the lower valleys were supporting any accumulation. It had been quite a unique Mother’s Day overall, hopefully one that the boys will remember for a while. Getting snow in May isn’t all that uncommon, especially for the mountains, but getting a snowstorm to fall right on Mother’s Day is lucky… or I guess unlucky as most people might have seen it. Additional weather details from Sunday can be found in my report to EasternUSwx.com.